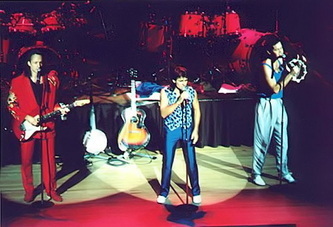 Later in the tour, “Mary, Mary” was dropped and “Through the Looking Glass” (with Peter on keyboards) was added. 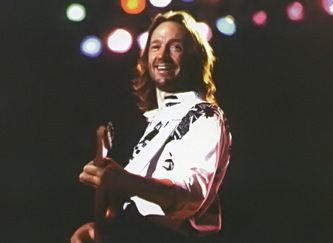 “Circle Sky” was played at the first couple of dates on the tour, but was dropped and replaced with "Goin' Down." 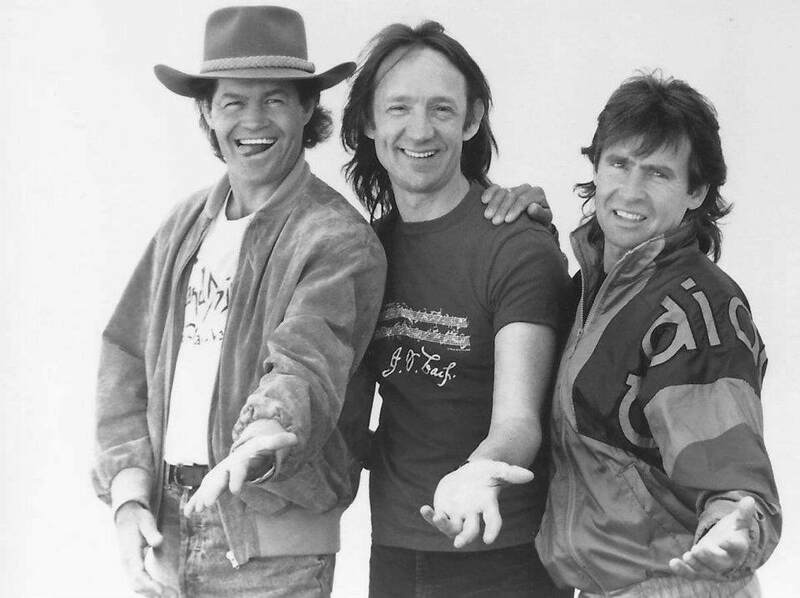 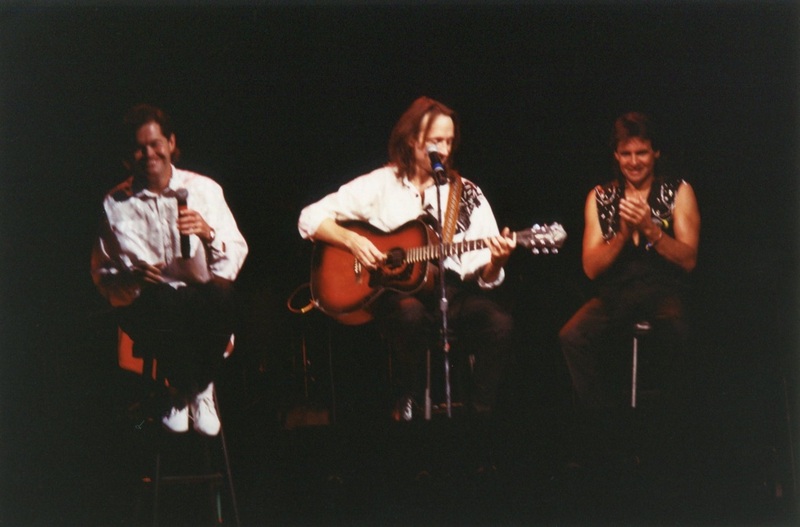 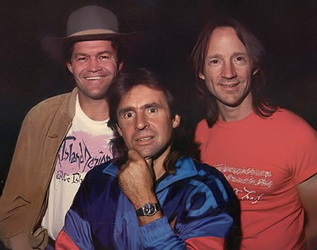 The Monkees' 1989 summer tour featured one of their best stage shows ever, but on the whole lacked the public enthusiasm and publicity that had surrounded the group's projects in 1986 and 1987. However, the trio had created a fresh show that included deep cuts from their song catalog, an acoustic set in the middle of the performance, and a new backing band to support them onstage. 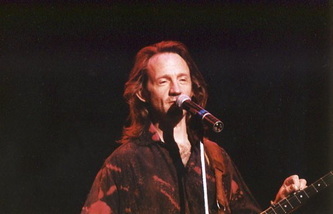 Songs like "She Hangs Out" and "As We Go Along" were debuted live while "D.W. Washburn" got its first airing in concert since the 1968 Far East Tour. 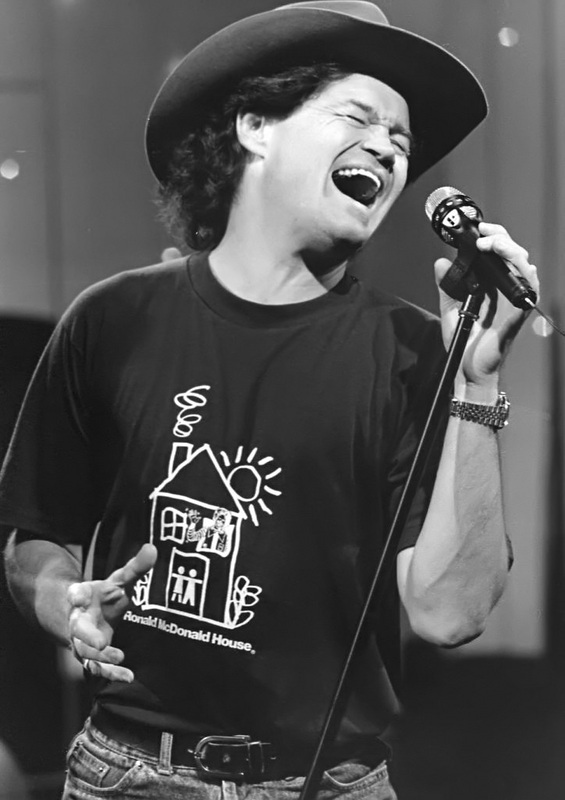 "What Am I Doing Hangin' 'Round?" 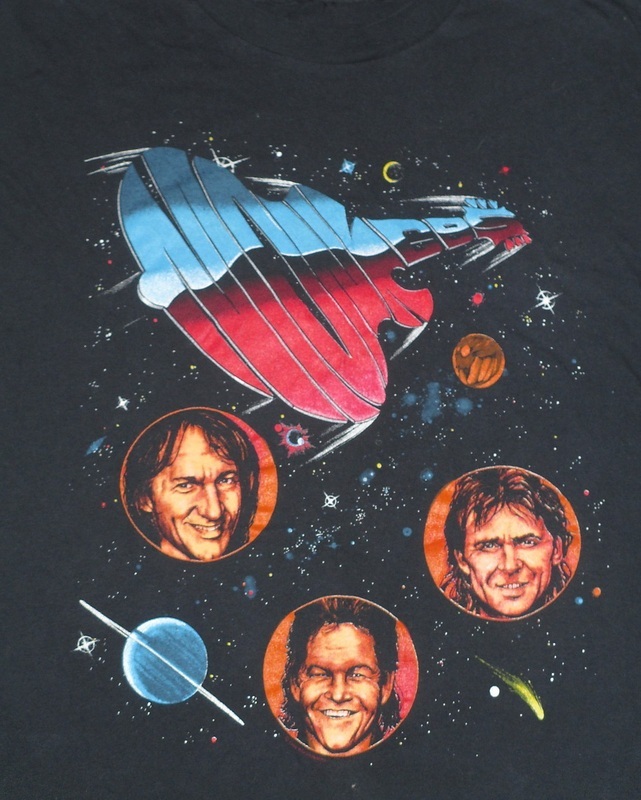 hadn't been played by the trio since the initial 1986 reunion and saw Peter take the lead vocal in Michael Nesmith's absence. 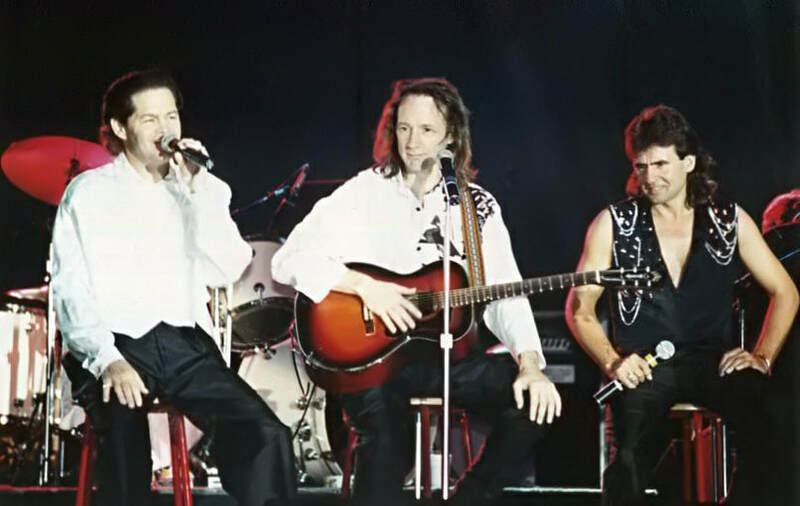 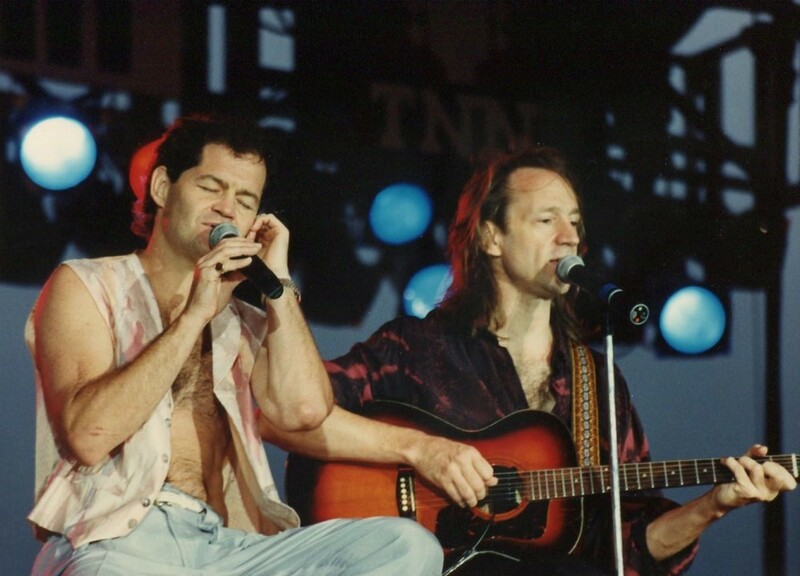 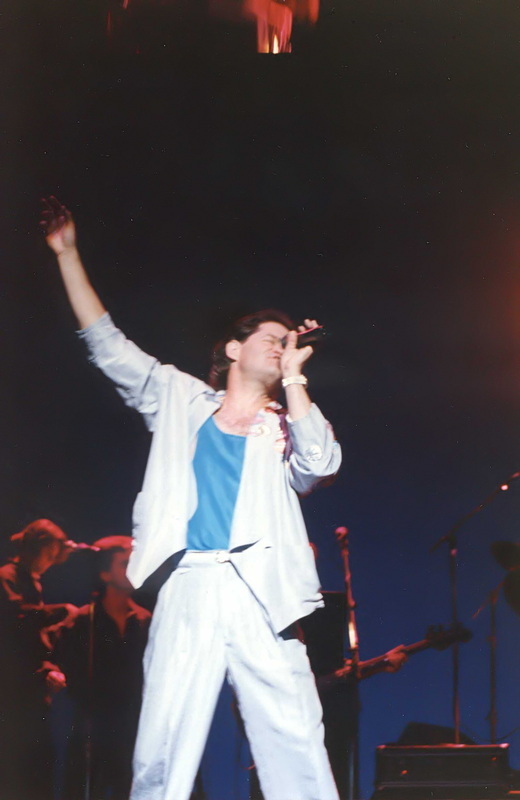 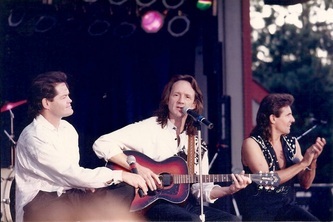 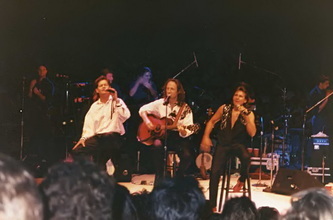 The acoustic set, initially performed during the European tour earlier in 1989, remained in the show and continued to be a highlight. 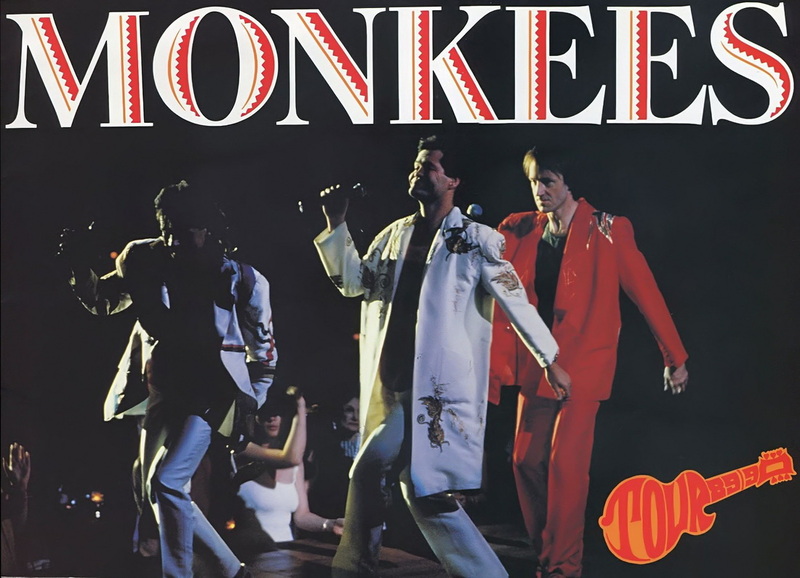 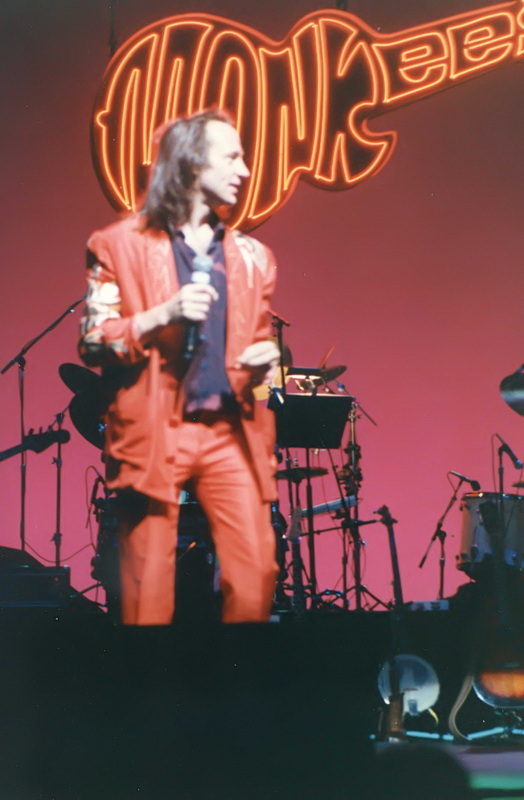 ​Before the 1989 summer tour got underway, Micky and his manager had proposed a three-year plan for The Monkees that would culminate in 1991 with the band's 25th anniversary. 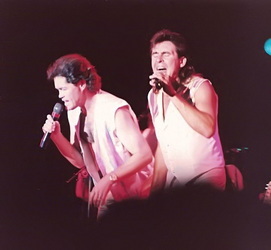 Davy, however, was reluctant to tour the United States without a new album on the market. 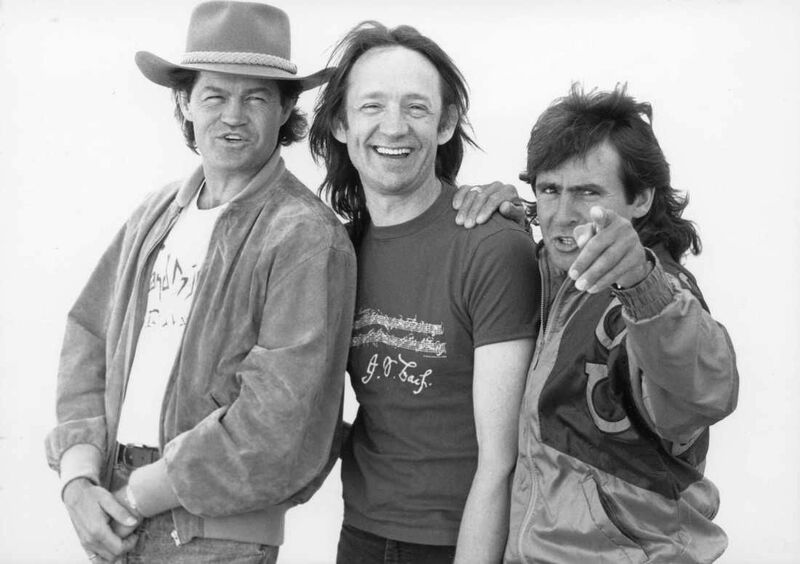 (Plans for a follow-up studio album to Pool It! 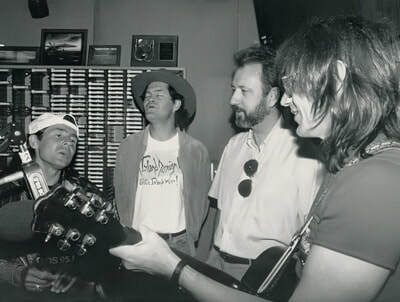 had been in the works at the time and there were offers on the table, but nothing was ever recorded.) 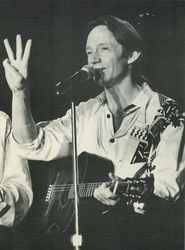 Jones also happened to have a lucrative offer on the table to play the lead role in Singin' in the Rain at the London Palladium. 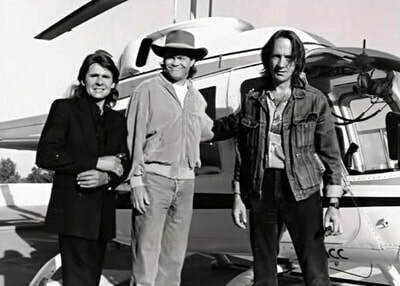 With Micky and his manager insisting that future recording deals and projects were in jeopardy without a summer tour, Davy agreed to go out on the road. 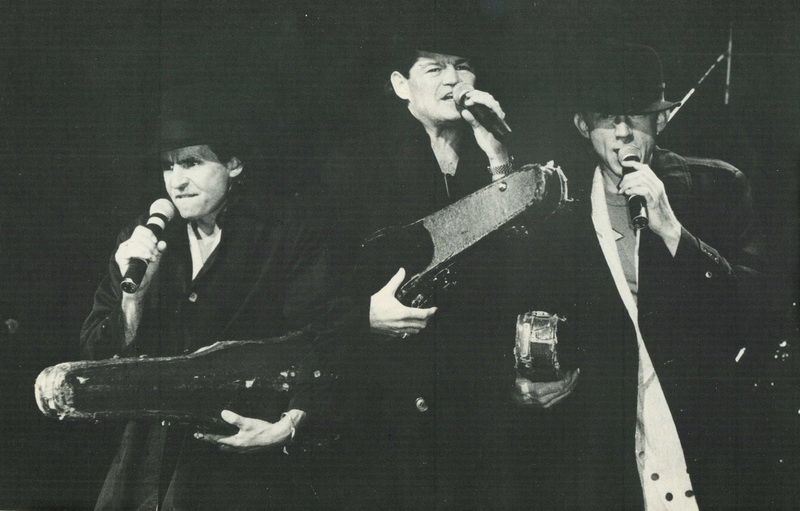 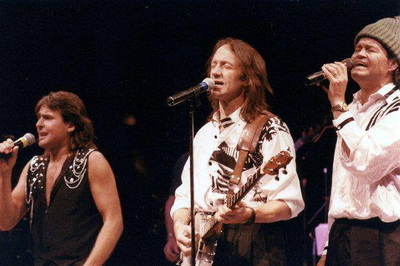 Then, halfway through the tour, Micky suddenly told Davy and Peter of his intensions to pursue a solo career after the summer dates were completed. 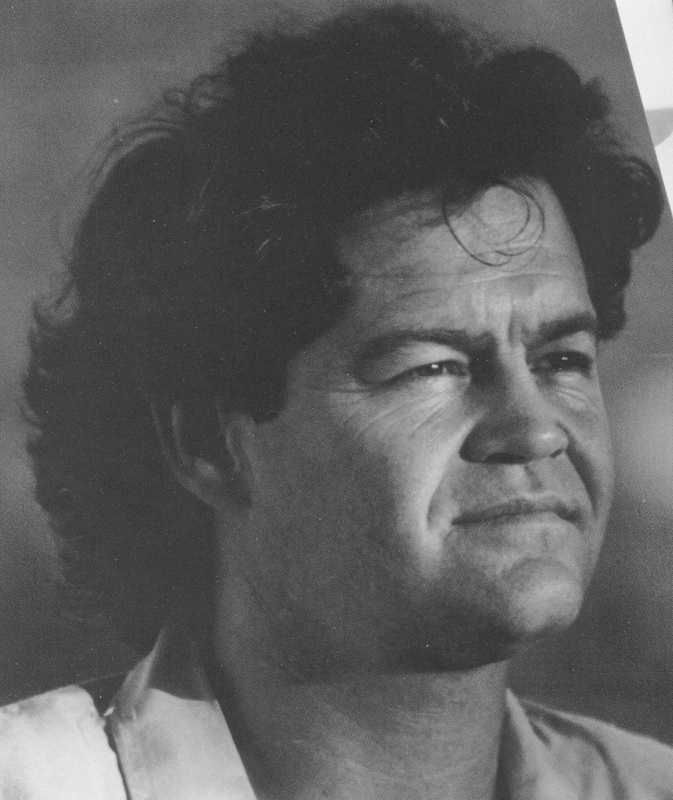 A rift developed within the group about Micky's decision as well as his preference to have his manager oversee Monkees activities. 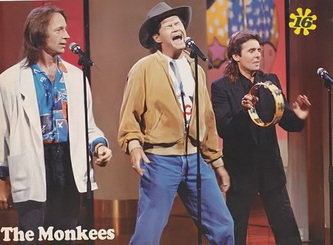 Later, as the tour started to wind down, Davy relayed in interviews that The Monkees would no longer be working together. ​Before internal tensions arose, prospects for the band seemed high. 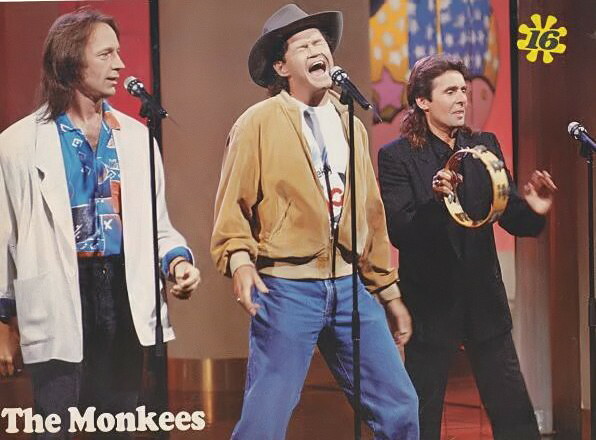 There was still talk of making another Monkees movie or television special, and recording a new album seemed like the next step. 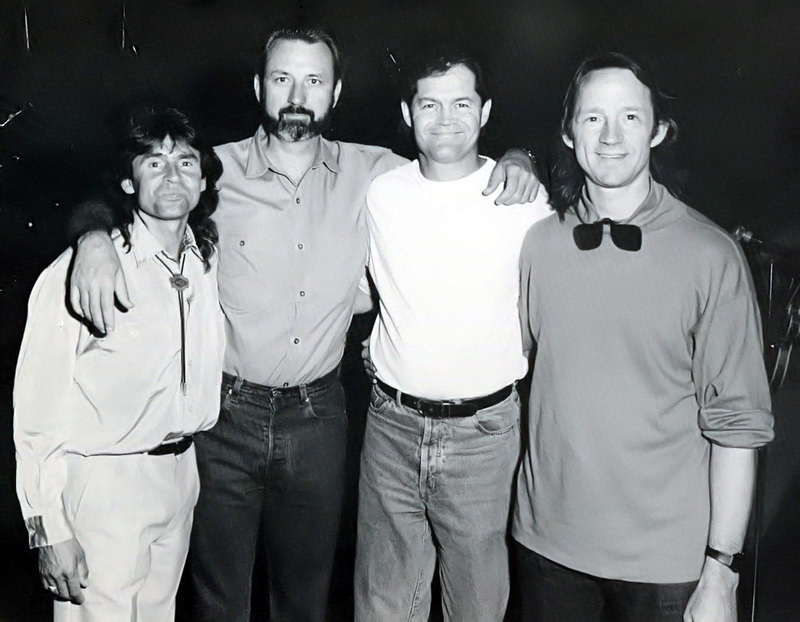 A special event occurred on June 28 when all four Monkees were guests on The Mark & Brian Show on KLOS-FM in Los Angeles, California. 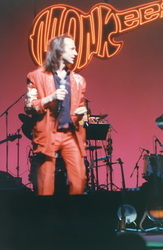 (Audio of this appearance can be heard below.) The quartet sang "Papa Gene's Blues" and "Daydream Believer" live on the air with Peter playing acoustic guitar. 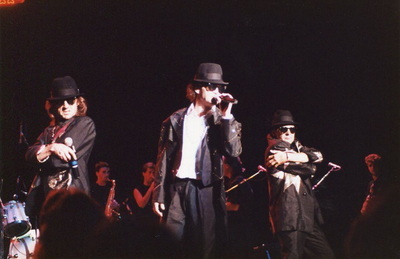 Michael was present to hype his upcoming concert appearance with Micky, Davy, and Peter at the Universal Amphitheatre, an event that would coincide with The Monkees receiving a star on the Hollywood Walk of Fame. 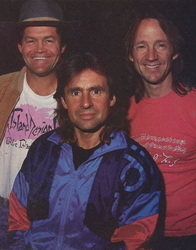 The full quartet also appeared on the radio with Rick Dees on KIIS-FM on June 30. 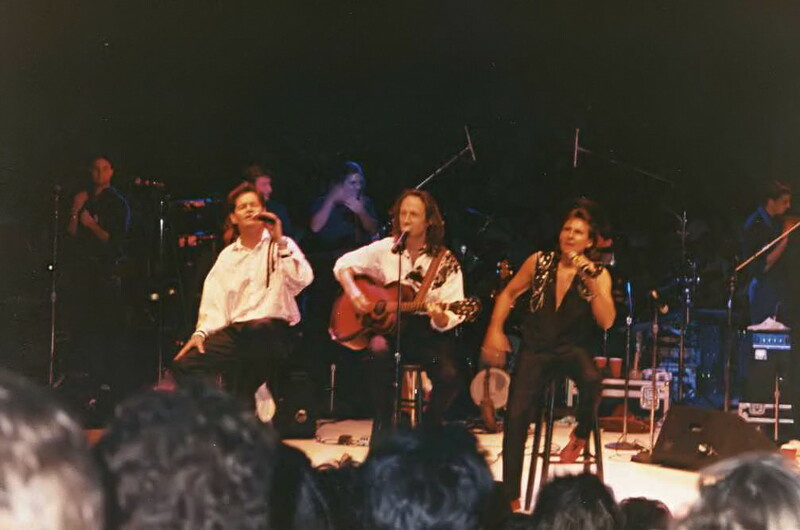 After the promotional activities with Nez, the trio began the final leg of the 1989 world tour on July 1 in Winnipeg, Manitoba, Canada. 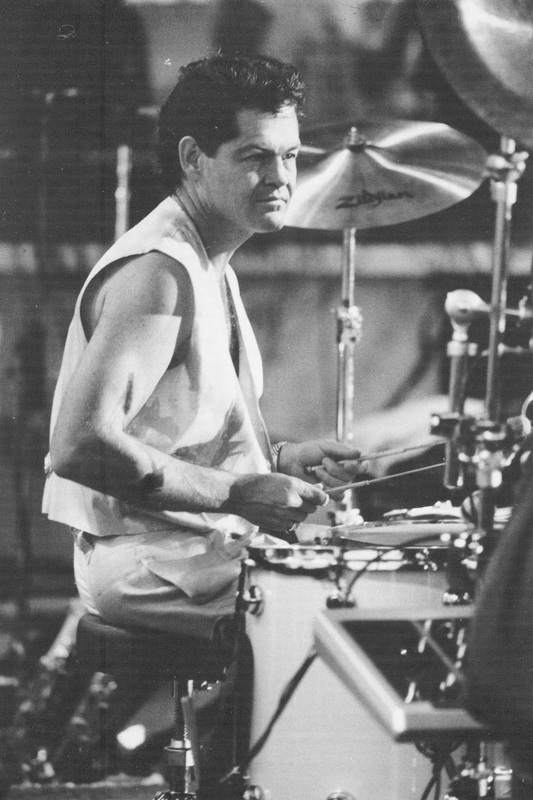 Micky played drums on most of the songs that he didn't sing the lead vocal. 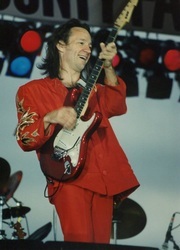 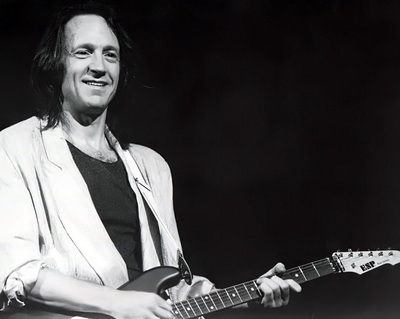 Peter supplied rhythm and lead guitar work, and played the banjo on "Cripple Creek" and "What Am I Doing Hangin' 'Round?". Davy added his usual percussion parts. 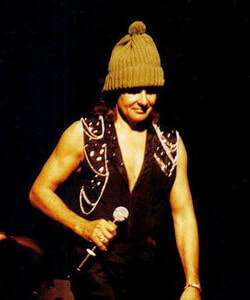 Two of Davy’s solo songs, “Hangin’ By A Thread” and “Baby, You’ll Soon Be Sixteen,” were added to the set, as was Peter’s solo song, “Sea Change,” which later was released on his 1994 solo album, Stranger Things Have Happened. 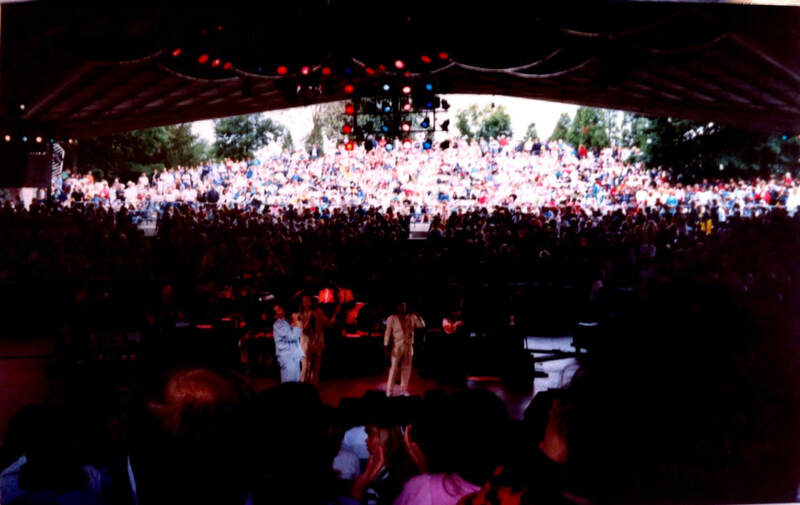 The 1989 summer concerts opened up with a cover of Gary Glitter's "Hello, Hello, I'm Back Again." 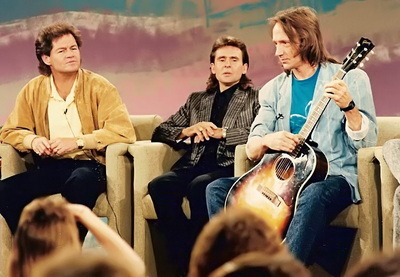 ​The Monkees appeared on The Pat Sajak Show on June 30 and Nashville Now on August 15 (the latter which included rare live television performances of "D.W. Washburn," seen below, and "What Am I Doing Hangin' 'Round?") 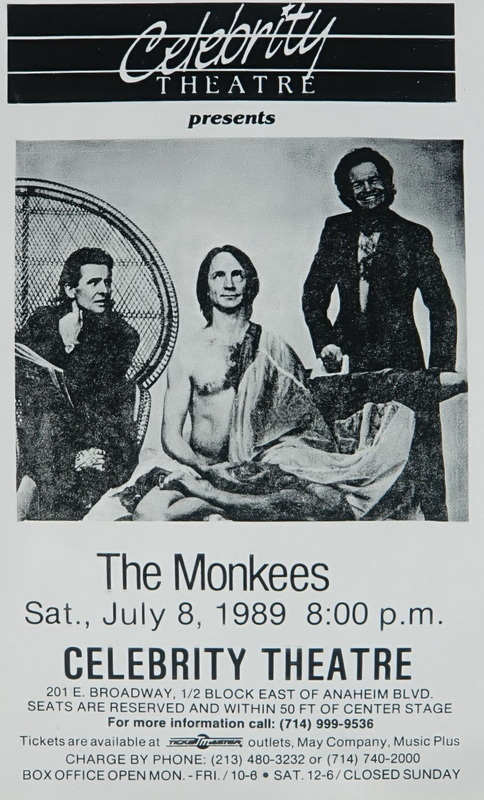 to promote the tour. 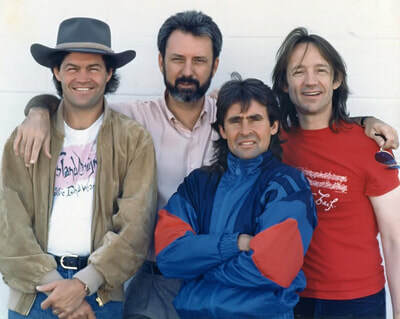 The backing band consisted of Jerry Renino (bass), Doug Trevor (rhythm guitar, who was also a member of The Cherokees, the group that opened for The Monkees in Australia in 1968), Frankie Hepburn (guitar), Norm Roper (drums), Tim Bonhomme (keyboards), Lawrie Haley (backing vocals), Scott Wright (trumpet), Les Lovitt (trumpet), and Mike Smith (saxophone). 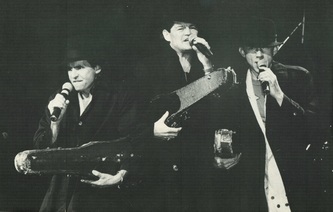 By 1989, the enthusiasm generated from the initial reunion in 1986 had subsided. 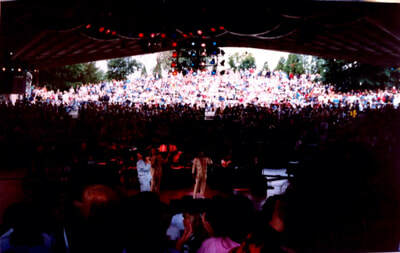 As a result, overall attendance figures weren't as strong in America as they had been in 1986 and 1987. 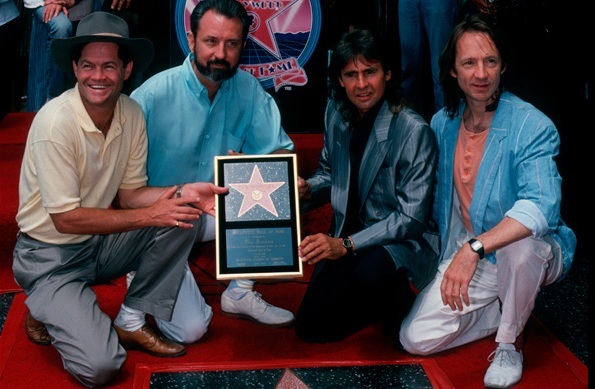 On the other hand, a lot of publicity was generated when Nesmith joined Dolenz, Jones, and Tork onstage in Los Angeles on July 9 at the Universal Amphitheatre. The following day, the four Monkees attended a ceremony in their honor when they received a star on the Hollywood Walk of Fame. 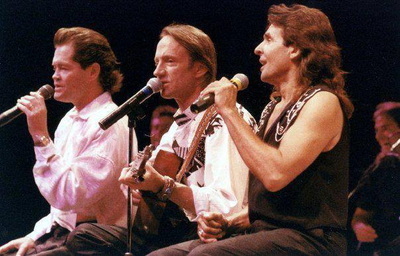 Despite a warm welcome in Japan where the group played their first concerts since 1968, the 1989 world tour ended on September 3 in Missouri to little fanfare. 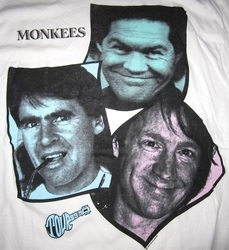 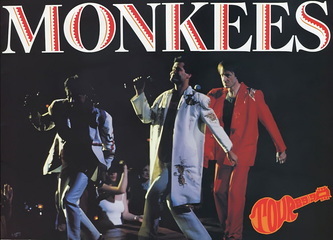 Because of bad feelings leftover from Micky's unexpected decision to embark on a solo career, The Monkees disbanded, ending the revival of the group that began with the celebration of their 20th Anniversary in 1986. 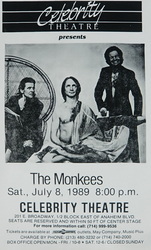 Peter, in an interview with Monkee Business Fanzine, broached the topic of the band's internal relations at the time. 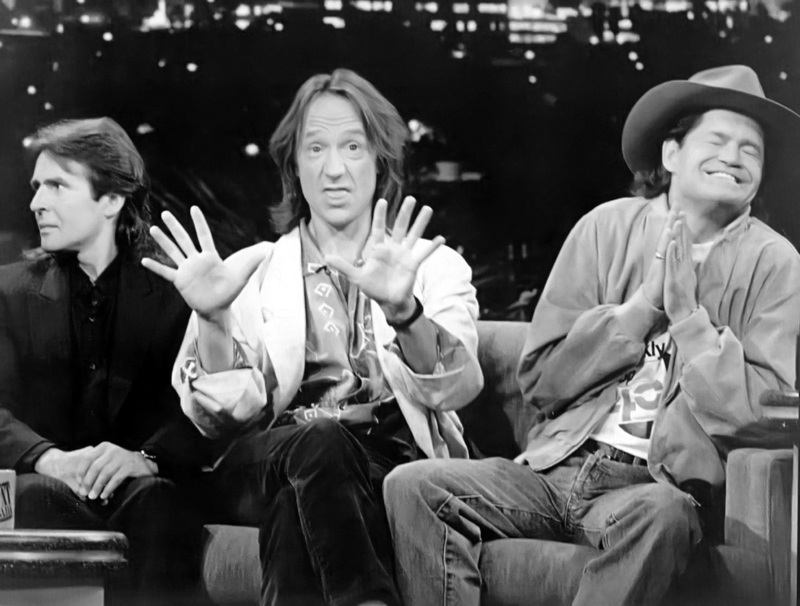 "The specifics are that it wasn't all that bad. 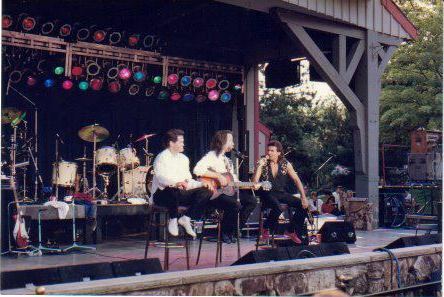 There was a communication block, and it continued because we knew that we'd go our separate ways soon and there'd be no need to communicate. 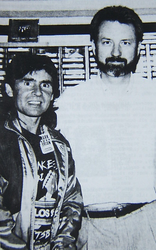 None of us was too happy with the way the partnership ended but we shook hands when we said goodbye." The Monkees would not return to the concert stage again until 1996.